As expected, the Federal Communications Commission (FCC) voted on Thursday to repeal the Title II net neutrality rules, essentially eliminating regulations that forbade Internet Service Providers (ISPs) from blocking certain websites or charging for higher quality service or content. It was a hugely controversial move that many warn will utterly upend the internet as we know it, and faced serious opposition from consumer advocates, politicians, and tech companies alike. Advocates of the decision argue that it will ultimately be good for competition, and will incentivize broadband companies to build more networks. 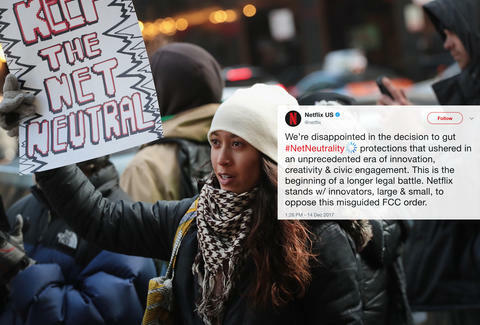 However, many polls suggested that an overwhelming majority of Americans -- as high as 80% -- were against the FCC's plan to kill net neutrality, so it stands to reason that reaction to the vote has been swift and spirited. Many have taken to Twitter to vent their anger and frustration. Don’t let @AjitPaiFCC fool you. The ONLY people benefitting from the repeal of #NetNeutrality are massive corporations that are already reaping in enormous profits. They want to end the internet as we know it to create a digital oligarchy that serves the wealthy few. Today’s rollback of #NetNeutrality is a brazen betrayal of American consumers, innovators, students, and entrepreneurs – all of whom will suffer tremendously without a free and open internet. While Thursday's vote is a bit of setback for supporters of net neutrality rules, its effect is not immediate or necessarily set in stone. For one, there is a chance that congress itself could block the decision (though that's considered unlikely), and the decision will almost certainly be challenged by a variety of consumer advocacy groups.